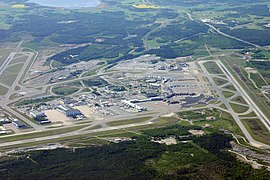 This is a list of the 100 busiest airports in the Nordic countries by passengers per year, aircraft movements per year and freight & mail tonnes per year. The list also includes yearly statistics for the busiest metropolitan airport systems and the busiest air-routes for 2012. This transport-related list is intended to be regularly updated as new statistics become available from the relevant official authorities. Political map of the Nordic countries and associated territories. The Nordic countries make up a region in Northern Europe and the North Atlantic which consists of Denmark, Finland, Iceland, Norway and Sweden and their associated territories which include the Faroe Islands, Greenland and Åland. Scandinavia is sometimes used as a synonym for the Nordic countries, although within the Nordic countries the terms are considered distinct, especially since Scandinavia is by definition made up of the countries Denmark, Norway and Sweden. The region's five sovereign states and three autonomous regions share much common history as well as common traits in their respective societies, such as political systems and the Nordic model. Politically, Nordic countries do not form a separate entity, but they co-operate in the Nordic Council. Linguistically, the area is heterogeneous, with three unrelated language groups, the North Germanic branch of Indo-European languages and the Finnic and Sami branches of Uralic languages as well as the Eskimo–Aleut language Greenlandic spoken in Greenland. The Nordic countries have a combined population of approximately 27 million spread over a land area of 3.5 million km² (Greenland accounts for 60% of the total area). Note: The statistics provided below does not include any movements by aircraft registered as military or touch and goes. Note: The statistics below is provided in metric tonnes with three decimal digits, i.e. with an accuracy of number of kilograms handled at each airport. The statistics does not include belly cargo transported on regular or charter passenger flights. Greenlandic airports are excluded from this list because of lack of information. The ranking does not include Greenlandic airports. Included below is statistics for the busiest air routes in terms of total passengers on board. When air traffic exists to/from or between secondary airports for a city/region, also the secondary airports are included in the statistics below according to the footnotes. 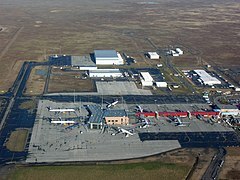 The main airport is defined as the airport handling the highest number of passengers for each city/region. This statistics include total passengers on-board between and within the Nordic countries. 4 In these statistics Malmö and Helsingborg/Ängelholm are separated from Copenhagen/Roskilde. When these airports in the Øresund region are considered together, flights between this region and Stockholm carried 2,885,369 passengers in 2012, making this the busiest intra-Nordic air corridor. This statistics include total passenger on-board between the Nordic countries and other countries within the European Union and member states of the European Free Trade Association. At the time these values refer to, the United Kingdom was part of the European Union, and is therefore still listed here. These statistics include total passengers on board between the Nordic countries and countries outside of the European Union and non-member states of the European Free Trade Association. ^ Årsregnskab See 2016 page 12. This page was last edited on 10 March 2019, at 22:08 (UTC).